Eleven Arts anime studio has licensed the North American distribution rights to Laughing Under the Clouds: Gaiden. It is a Japanese film adaptation of the hit manga and anime series Laughing Under the Clouds. August 24, 2018, has been set as the theatrical release date. The film will debut in the U.S. with Parts 1 and 2. A third installment is scheduled for next year. 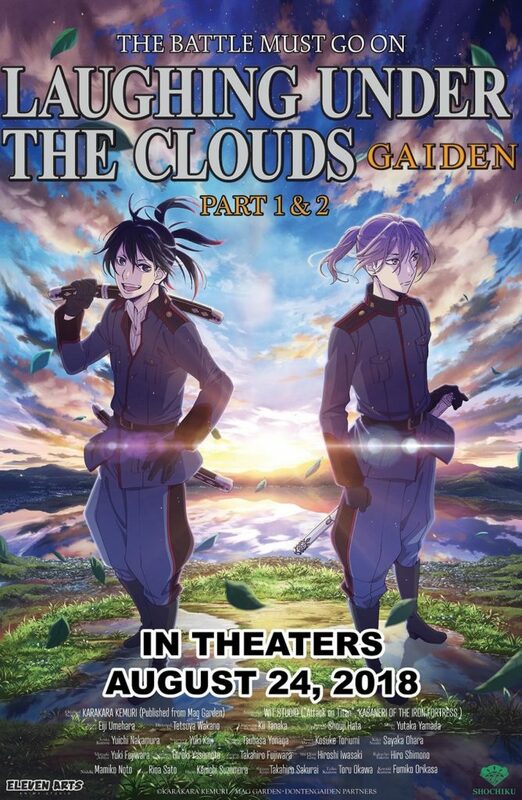 Laughing Under the Clouds: Gaiden will screen with the original Japanese dialogue and English subtitles. This sounds great because I like my anime content just like that. It just sounds more authentic to me. Fans of Wit Studio’s previous works might enjoy the upcoming release as the studio has worked on Attack on Titan and Kabaneri of the Iron Fortress. There is a lot of action and drama in Gaiden. It also talks about a number of universal themes including grief, sensitivity, compassion, violence, and depression. Gaiden picks up where the original series left off, in the wake of the Yamainu squad’s battle with the formidable Orochi serpent. Now that the Yamainu have vanquished their enemy and escorted all criminals to the local prison, government officials decide to outlaw swords – putting Japan’s great avengers out of a job. So now the Yamainu, all trained assassins, must pull together to find a new cause, one within their own group. Although he ought to feel victorious, the Orochi took its toll on squad leader Tenka, the eldest of the Kumou brothers. Tenka’s paraplegic condition, rendering him unable to help his teammates in battle, leaves him with severe guilt and self-doubt. No longer threatened with possession by the Orochi, Tenka must reconcile with his own inner demons, and the squad must save him from himself. Eventually, internal disputes will turn themselves inside out again, when a new enemy emerges from the shadows. The Fuuma ninja clan, who assassinated the Kumoug parents years before, inches one step closer to their goal of reviving the Orochi, with the help of some surprising allies. Now the remaining Yamainu will find themselves back in employment. For more information and purchasing tickets, make sure to visit Eleven Arts. Next: Will NBC Give Fans A Reverie Season 2? I Sure Hope So!